Are you looking for a coding project for your class? Here’s an idea for a creative assessment, using the Turtle module in Python or Blockly. Some Turtle flowers we made earlier! 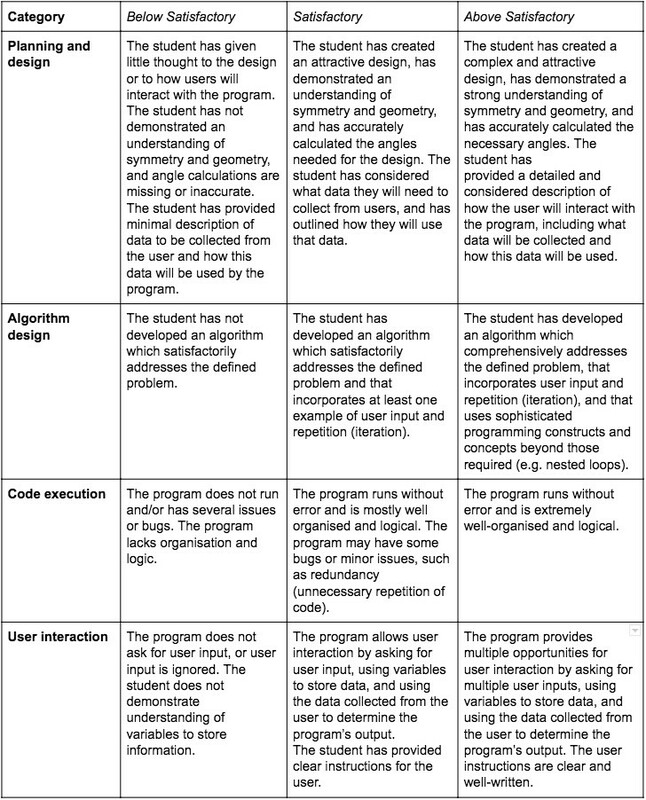 This coding task assumes knowledge of the below concepts. These concepts are covered in our Introduction to Programming in Python or Blockly courses, and many of the concepts are addressed in our free short activities as well! Collecting and using user input. Project Task: Build your own Flower Bot! 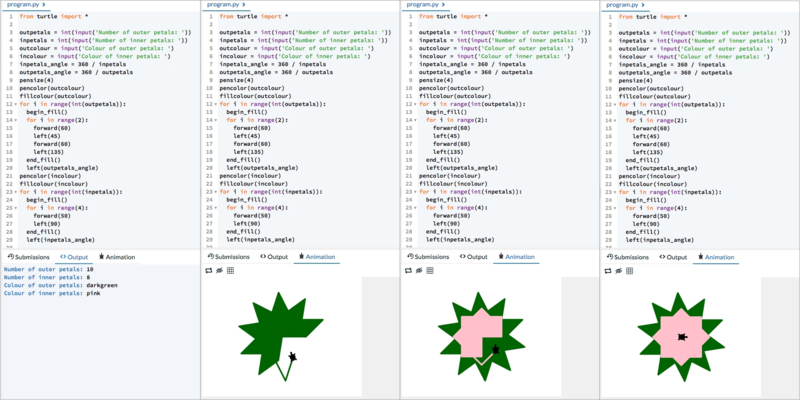 Write a program to draw an attractive flower of your own design. Think about using colour, fills, geometry and symmetry when creating your design. Collect user input and let the user control some aspects of how the flower looks. For example, the user might be able to choose the number of petals, or the colour of the flower. Sketch some early designs for your flower. What angles will the turtle need to turn to draw your design? Include the angle calculations in your sketches. How well does your program run? Does it have any bugs? Is your code clear, logical, and easy for someone else to follow and understand? How many options do you give the user to control the design of the flower and how well does your program use this data? Does your program avoid unnecessary repetition by using loops where possible? We’ve provided a sample assessment rubric below. You can also click here to download a pdf version. 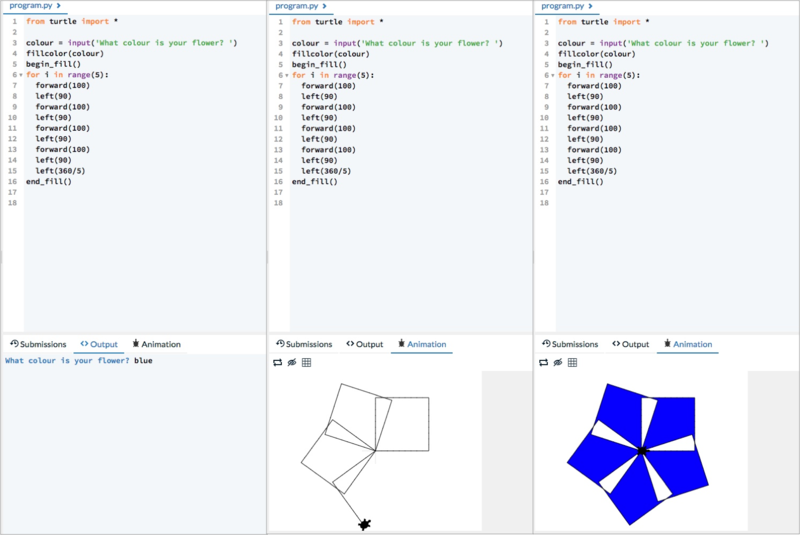 We’ve also created a few sample programs you can try out and tinker with yourself, or show to your students for inspiration. Have you tried this project with your students? We’d love to hear how it went! Leave a comment or send us an email (info@groklearning.com). And, if you’ve found this article helpful, please give it some👏 ! Learn how to program the Turtle — try our Intro to Programming course, our Maths and Computing course, or one of our free short activities. Thanks to Christie McMonigal and Tara Murphy.